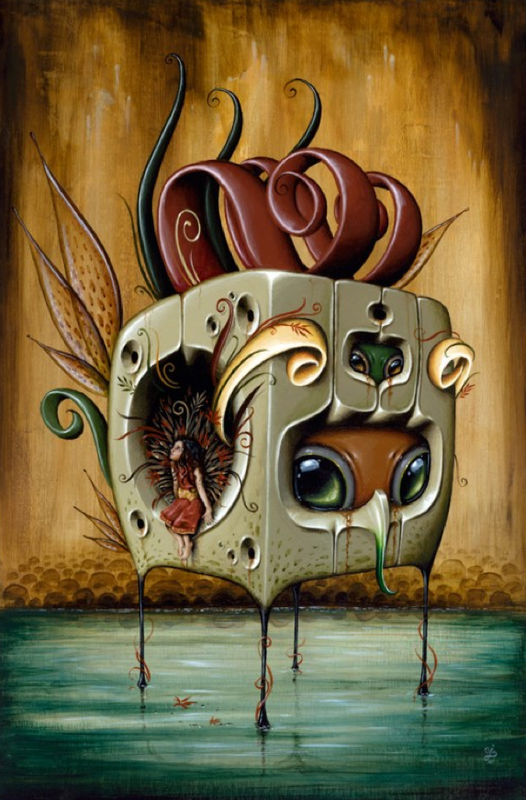 Jason Limon’s artwork has been dubbed pop surrealism, categorized as fantasy, and called abstract. The artist himself, however, remains hesitant to apply a label to his work. Indeed he should be. 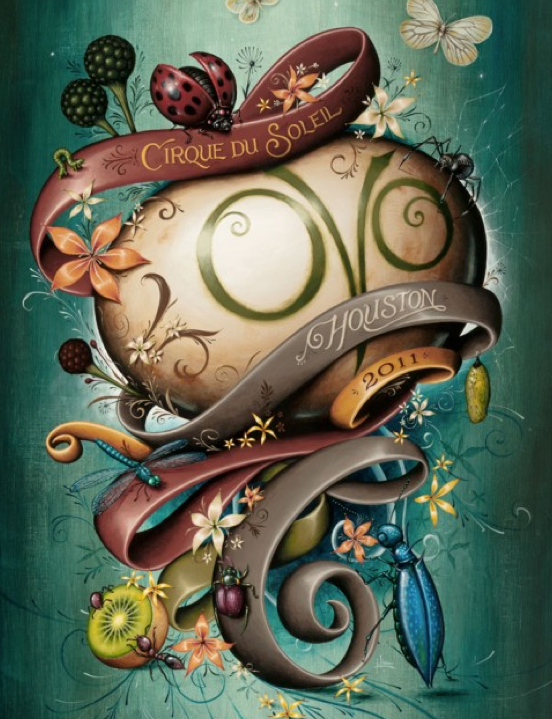 Limon’s work; at times whimsical, at times haunting, defies base description and refuses to be pigeon-holed. I don’t want to call my art anything specific. It is whatever it is to the people who view it. All of those categories fit, but I’d rather not apply any kind of label on my work. It just is. The 38-year-old San Antonio native found early success as a graphic designer. Having sought out a formal education for such, and displaying an obvious talent, Limon soon realized that the formality and structure didn’t fulfill his creative needs. Limon would see visions, dreams that seemed to suggest a narrative to Limon, and it became clear that this story needed to be told through his painting. The paintings I do are a story, and the vision usually comes to me right before I go to sleep at night. It’ll pop into my head, really clear, and I have to get up and sketch it out before I lose it. I generally have a hard time remembering things; I usually forget things [in detail] pretty quickly. But these visions I see stay with me, at least until I’m able to get the concept down on paper. Then I’ll come back later and paint it. 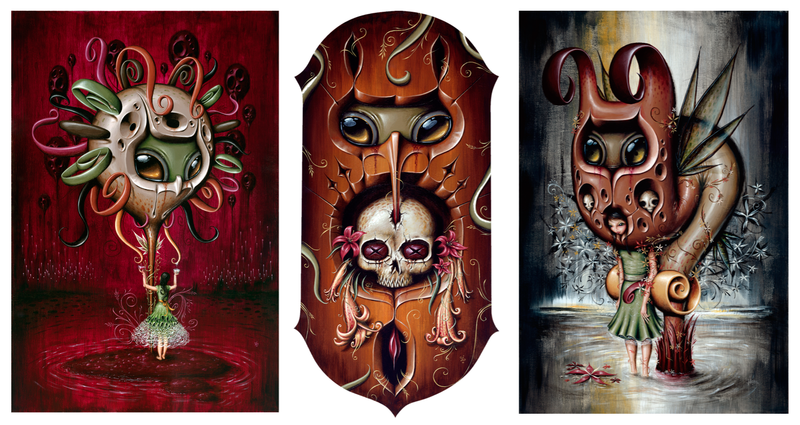 Limon’s work evolved from his earlier paintings in 2008 to his current Blood/Nectar series, moving from a more subdued tone to more vivid, vibrant, and contrasting color harmonies. It’s this juxtaposition that lends an intriguing duality, simultaneously cheerful while dreadfully ominous. Most of his work features a curious creature, often mistaken to be an owl, in which is appropriately representative of the artist’s watchful and observant nature (on Limon’s personal website, he describes himself as an observer of our world, silently scanning its elements and the beings who move among them) while also raising the question: is this creature keeping a watchful eye, or is he hiding from something? And if he is hiding, what is he hiding from? The creature is definitely me, and it’s interesting that you would notice that it is watching over all that is going on around him, but is also hiding from it. The story behind the work, and each piece, to me, is just another part of the story, somewhere in the middle; but it’s about plants, and the growing war between plants, and our environment, and industrialization, and whatever is going on in the world that impedes nature. I never intended to be green by any means; it’s just a storyline that popped into my head, and as I started painting these scenes, I would have more ideas for more scenes. It was like I couldn’t keep up with them. Given the narrative quality to Limon’s work, and the abstract presentation of those ideas, one might surmise that the artist is concerned with how his story might be received. Transcending other artwork that might carry a message or idea contained inside of itself as a stand alone piece, Limon’s work, when considered as a collection, tells an episodic narrative, while still maintaining its ability to be enjoyed and received individually. Yet, to hear the artist tell it, his ability to get his story out and exorcise it from his mind supercedes any concern of public consumption. I can’t and I don’t really think about how people are going to receive it or think about it. If they get it’ and can follow the narrative, that’s awesome, but if they don’t necessarily see what’s going on and just think it’s something cool to look at, that’s okay too. It’s way more important for me to get this story out. Sometimes, with some of the pieces and the pictures on my Flikr page, I’ll leave comments to help explain what’s going on in the painting if I feel like the concept in a given piece might be a little too broad for most people to understand. But generally, if someone just looks at it and thinks it’s interesting to look at, and that’s all they see, that’s fine. Maybe someday I’ll get around to putting the story down in print form so it’s easier for people to understand. Right now though, I’m just driven to get as much of these images out as I possibly can. With as prolific as Limon is (he estimates it takes approximately three weeks from concept to completion), and given the vast potential for his Plants vs. Society concept, would he eventually FIND an ending to this story? It’s interesting; I don’t think this story could ever have a true ending. The story, as I see it and experience it, if I live long enough to see that come to a finality, then that story will end, but everything always changes, so if that story does end, there will just be something else that happens, and either a new story will begin, or this one will simply continue on.